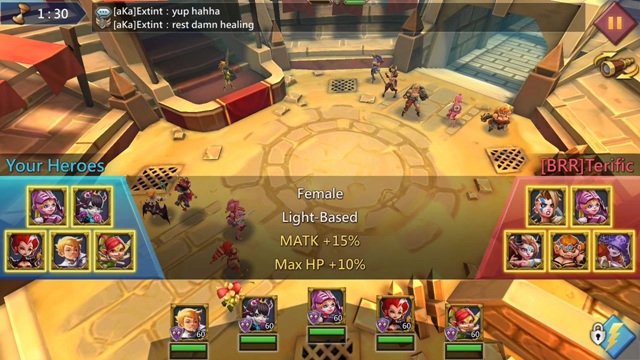 In Lords Mobile, Colosseum is a hero arena where players need to deploy 5 strongest heroes to fight against other players by PVP combat. The combat runs automatically but you still need to consider the lineup and the combination of heroes. Every week, there is an active constellation that will say which hero types get buffed. It is best to have as many as possible high level heroes to be able to pick constellation heroes which can turn the tides of the battle. For the free-to-play players, you can still get high colosseum ranking when you understand the mechanics of battle and advantage match up between different heroes. The guide is originally written by Gawaingod, and the reproduce version has some light editing. The main hero for Colosseum that you need to unlock is Rose Knight (Rose) – Tank, Heal, Protect and Stun. You need to unlock her as soon as you can (normally around level 55-57) if you want to do well in Colosseum for a F2P player. See my award winning guide on tips on how to unlock her here. The medal requirements and realistic time-frame to acquire gold heroes are below: 10 medals -> White 20 medals -> Green 50 medals -> Blue 100 medals -> Purple 150 medals -> Gold Total is 330 medals. Average drop rate is 33% = 990 attacks If you are active and log on every 12hrs, you can do 20 attacks a day. Meaning it will take you about 49.5 days to make 1 gold hero. Each Braveheart you use will cut that time by 12hrs. Completing turf quest also give a few STA here and there. Rank allows new skills to be learned and to increase rank you have to equip 6 trophies and upgrade your rank. The trophies have level requirements and provide bonus stats so if you always use this particular hero in the col, make sure he is wearing as many trophies as your level allows. Demon Slayer, Trickster, Tracker, Black Crow, Incinerator. My favorite – Tracker has the single most deadly single target ultimate in the game, usually 1 hit to kill an enemy Demon or Donna. His Rank 7 skill increases his crit rate to make him even more deadly. Snow Queen if you feel your donna is dying before she can cast her frost heal. Team 1) Rose Knight, Prima Donna, Sea Squire, Tracker, Demon Slayer. Team 2) Rose Knight, Prima Donna, Petite Devil, Tracker, Demon Slayer. As a F2P player, to guarantee a win, you need to kill their Donna fast and keep yours alive. The easiest way is hoping for demon slayer crit after the Trackers arrow storm. She will die before the 1st heal. Team 1) My Demon Slayer is only blue and hence, I need the sea squires heal to trigger so he doesn't die and has a chance to crit the enemy Prima Donna. Team 2) Petite Devil is chosen over Sea Squire sometimes as she will normally cast her stun before the enemies Prima Donna casts her heal. This 5 second stun will allow a few more hits on the Prima Donna by your Demon Slayer, hopefully killing her. Every Week the constellations change. Sometimes there is a negative buff for one of your heroes. If it happens to affect your main team, You need to decide if it's better to swap out the affected hero for the 2nd best one. -Normally if they are more than 2000 points below your team, you should be able to beat them. -Try to win as much as possible, Win = player xp Some scenarios and counters Big guy>demon ( because he will stun you before you can blink behind him to kill his Donna ) *If enemies have big guy swap out Demon for Incinerator. Incinerator > Big Guy ( Will nuke him to death in seconds ) *if enemies have no attackers ( 4 tanks + donna or 3 Tanks + 2 heal ) Rose and 4 attackers, forget Donna, you aim will to kill the tanks before the 1st enemy Donna heals ) My final tip is about AOE. AOE is a double edged sword. If used wrongly, will cause the enemy Donna to gain MP faster and cast heal before you can kill her. Equip as many trophies on your your heroes as you can. Make Rose Gold, followed by Donna. Decide on a team – make those you want to use Gold Follow my tips on picking enemies. Collect 70 or more gems every 3hours keep leveling up your player level and getting more and more gold heroes to make your team more versatile during the different constellation. Thank you all for reading. Good luck.